Tugce Canitez (24) played a big part in Westmont’s 68-64 victory over top-ranked Azusa Pacific in their Golden State Athletic Conference opener. Tugce Canitez’s roommates at Westmont College hung a big Turkish flag on the wall, their way of saying they wanted her to feel comfortable 7,000 miles from her hometown, the port city of Izmir. It’s not all that different, Canitez said. “The beach, the weather — it’s the same in Turkey and California.” And there’s one place where she is totally familiar with the surroundings: the basketball court at Murchison Gym. Basketball is a thriving sport in her country. A half-dozen active NBA players, notably Hedo Türkoğlu of the Orlando Magic and Mehmet Okur of the Utah Jazz, hail from Turkey. Westmont hoop fans have been overjoyed to watch Canitez play for the Warrior women’s team. They have taken to calling her “Tooch” (her first name is pronounced like “touché”), and she is so busy on the floor that it seems there are two Tooches out there. Through 10 games — nine of them Westmont wins — the 6’2” junior forward was averaging 17.7 points, 9.3 rebounds, and 2.2 assists. Those statistics do not include an exhibition game at USC, where Canitez had an eye-popping 33 points. With her help, the Warriors are off to a blazing start. In their Golden State Athletic Conference opener, they upset defending national champion Azusa Pacific, the number-one team on the NAIA preseason poll, by a 68-64 score. The victory boosted Westmont to number six, its highest ranking ever, when the first in-season poll was released. 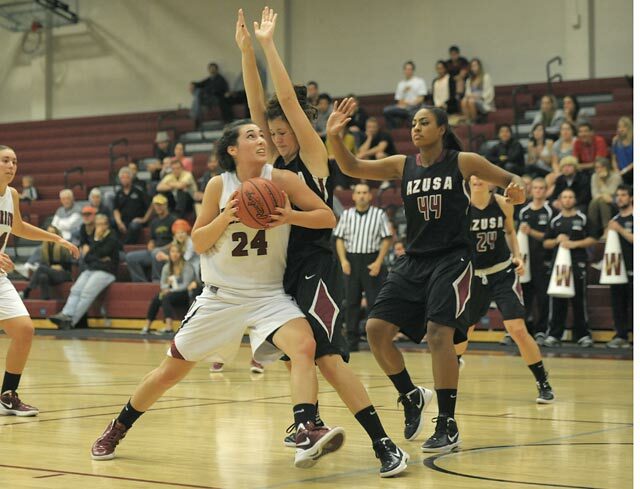 The Warrior women had to rally from a 13-point deficit (41-28) in the second half against Azusa Pacific. Canitez (18 points, 12 rebounds) played a big part. A skilled dribbler, she was able to bring the ball up against Azusa’s full-court press and trigger several transition baskets by senior guard Katie Kittle, who scored a game-high 26 points. “When you have a 6’2” player handle the ball like that, it’s quite a weapon,” Westmont coach Kirsten Moore said. It was the Cougars who succumbed to the Warriors’ defensive pressure in the final 15 minutes. Canitez, 21, has played for the Turkish national women’s team and could be on their roster at the London Olympics. But she does not put on an air of superiority at Westmont. After the Christmas break, the Westmont women will return to action on Thursday and Friday, December 29-30, with a pair of home games against Pacific Union and Cal State Maritime. Those are being played in conjunction with the Westmont men’s 36th annual Tom Byron Classic. GAUCHO HOOPS: UCSB will host Pepperdine in a women’s basketball game at the Thunderdome Friday, December 16, at 7 p.m. It is a homecoming for Tessa Emerson, an All-CIF player at Santa Barbara High last season. The 6’2” reserve forward has averaged eight minutes a game for the Waves. She got her college career off to a heady start, making all three of her shots before a crowd of 12,147 at Tennessee. … UCSB’s men are on the road to play a pair of Pac-12 championship contenders — Washington (Friday, 7pm) and California (Monday, December 19, 7:30pm). POLISHED SILVA: Senior midfielder Luis Silva is the first UCSB men’s player to be named to the Division 1 All-America First Team by the nation’s college soccer coaches. Silva capped a stellar career with 17 goals and 10 assists this past season.